Home - Change Management Professionals Inc.
We help make Change successful and the process less stressful. Here are 4 common mistakes we help you avoid. Return on Investment (ROI) goals are not clearly identified at the outset. In business, making a change of substantial scope should positively affect the bottom line and as such must be measureable in terms of a return on investment. It has been our experience that too often until we bring this fact to our client’s attention, it is overlooked. The leaders who authorize the change have not clearly defined the outcomes – the ROI they want from the change. Human beings like certainty. For most people, Change creates uncertainty and uncertainty makes people anxious. 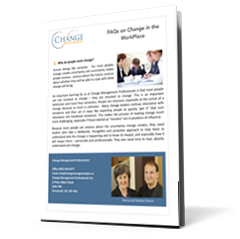 For help understanding why it’s important to mitigate this anxiety among employees, download the answers to our 10 most frequently asked questions about Change in the workplace. Organizations do not engage and prepare employees for the change soon enough. Not enough attention is given to how the change impacts current work processes of various employee groups. Often communication with employees and other stakeholders is focused predominantly on the change itself – how it works – and less emphasis is placed on its impact on work groups. This approach (or lack of approach) often creates resistance to change among staff members especially when answers to questions are not clear or it seems the questions were not even considered. Leaders communicate only when there is something "new" to say. When it comes to leading change, communicating with all employees early and often with clarity and integrity is critical. As we’ve noted, in the absence of information, vulnerable people will fill the void with what they surmise. It’s important to never allow a communication void to exist. "When we needed to re-organize our business a professional colleague referred us to Change Management Professionals. After a thorough review of our company including business processes, resources, goals and objectives, etc, Change Management Professionals produced a comprehensive analysis and roadmap which guided us through the process and serves us to this day. Since then we have engaged Change Management in other areas including hiring and managing resources, process implementation and counselling. The quality service we have received over the years from Change Management Professionals has been excellent in all areas. We are a name, not another number. Whether it’s interviewing staff, implementing a process or simply discussing business, their personalised approach and passion for helping you succeed ensures your success." "Having trust in the key people around you is vital to growing and maintaining a healthy company. When Stephen began working on strategy with our company, it quickly became clear that Stephen had expertise in Human Resource fundamentals and challenges, as well as other areas of our business. He and Donna have become two of our most trusted advisors, and friends, over the years. I have referred some of the most important people in my life to Stephen and Donna, and will continue to do so." Please download this free document we’ve written. It emphasizes why it is so important to approach Change methodically. Read it and then contact us for a one-hour free consultation about the Change you’re embarking on.